G. Indrayanto, A. Syahrani, Mugihardjo, A. Rahman, Soeharjono, W. Tanudjojo, S. Susanti, M. Yuwono, and S. Ebel, Benzoic Acid. R. Hall, G. Havner, J. Baker, G. Stafford, W. Schneider, W. Lin, J. May, M. Curtis, C. Struble, B. McCue, D. Jasheway, and D. McGee, Brinzolamide. A.H. Abadi, S. Rafatullah, and A.A. Al-Badr, Chlorpromazine. F.J. Muhtadi, Cortisone Acetate. A.A. Al-Majed, F. Belal, and A.A. Al-Badr, Diloxanide Furoate. M.-P. Quint, J. Grove, and S.M. Thomas, Dorsolamide Hydrochloride. B.D. Johnson, A. Howard, R. Varsolona, J. McCauley, and D.K. Ellison, Indinivar Sulfate. F. Belal, A.A. Al-Badr, and M.M. Tayel, Procaine Hydrochloride. A.W. Newman, I.M. Vitez, R.L. Mueller, C.C. Kiesnowski, W.P. Findlay, C. Rodriguez, M. Davidovich, and G. McGeorge. Cumulative Index. Although the official compendia define a drug substance as to identity, purity, strength, and quality, they normally do not provide other physical or chemical data, nor do they list methods of synthesis or pathways of physical or biological degradation and metabolism. Such information is scattered throughout the scientific literature and the files of pharmaceutical laboratories. 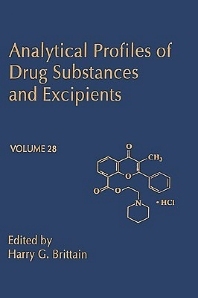 Edited by the Associate Director of Analytical Research and Development for the American Association of Pharmaceutical Scientists, Analytical Profiles of Drug Substances and Excipients brings this information together into one source. The scope of the series has recently been expanded to include profiles of excipient materials. Analytical, pharmaceutical, and medicinal chemists; pharmacologists. Dr. Brittain is presently the Institute Director of the Center for Pharmaceutical Physics, a research and consulting institute he established in 1999 for the study of substances having pharmaceutical interest. His research interest include all areas of pharmaceutical physics and physical pharmacy, including preformulation, formulation design, product characterization, polymorphism, solvatomorphism, and cocrystals of drug substances. Formerly, Dr. Brittain was Vice President for Pharmaceutical Development of Discovery Laboratories, Inc., he served as Director of Pharmaceutical Development at Ohmeda, Inc., and also led a variety of groups within the Analytical R&D department at Bristol-Myers Squibb. Dr. Brittain is a graduate of Queens College (B.A. in chemistry, 1970; M.A. in physical chemistry 1972), and of the City University of New York (Ph.D. in physical chemistry, 1975). He was a postdoctoral fellow at the University of Virginia, and has held full-time faculty positions at Ferrum College (Assistant Professor of Chemistry) and Seton Hall University (Associate Professor of Physical and Inorganic Chemistry). He has been Adjunct Professor of Pharmaceutics at Rutgers University, and both Adjunct Professor of Chemistry and Visiting Research Scientist at Lehigh University. Dr. Brittain has authored over 340 research publications and book chapters, and has presented over 175 invited lectures and short courses in the pharmaceutical field. He has edited the monographs Analytical Applications of Circular Dichroism, Physical Characterization of Pharmaceutical Solids, Polymorphism in Pharmaceutical Solids (first and second editions), Spectroscopy of Pharmaceutical Solids, and Preformulation in Solid Dosage Form Development. He is also the Editor-In-Chief of the book series Profiles of Drug Substances, Excipients, and Related Methodology, having edited 23 published volumes in the series that is now published annually by Elsevier. Dr. Brittain is also an Editor of Physical Pharmacy for the Journal of Pharmaceutical Sciences, and is a co-author of 22 issued United States patents. During his academic tenure at Seton Hall University, in 1980 Dr. Brittain was named as one of the Teacher-Scholars of the Camille and Henry Dreyfus Foundation. Dr. Brittain was elected as a Fellow of the American Association of Pharmaceutical Sciences (AAPS) in 1991, and received the AAPS Research Achievement Award in Analysis and Pharmaceutical Quality in 1998. He is also a Fellow of the Royal Society of Chemistry.